For our first Southern Nomad post, I thought it would be a good idea to take a walk around the Gaia garden and the neighborhood where we are located, giving ya'll an idea of what our little corner of the universe is like and featuring some places you might want to check out when you are visiting us at the Gaia Studio and Nomad Boutique. 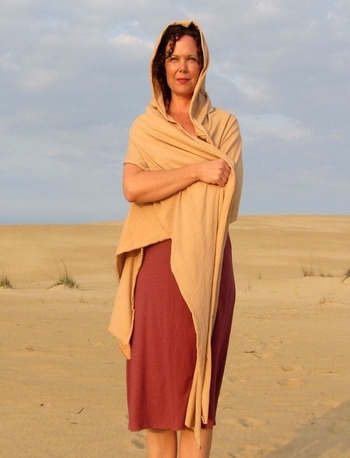 It was a REALLY hot day here in Greensboro, NC when I set out for my walk, so I chose lightweight, loose fitting fabrics for the majority of my Gaia ensemble, all of which can be purchased at http://www.gaiaconceptions.com/shop/. 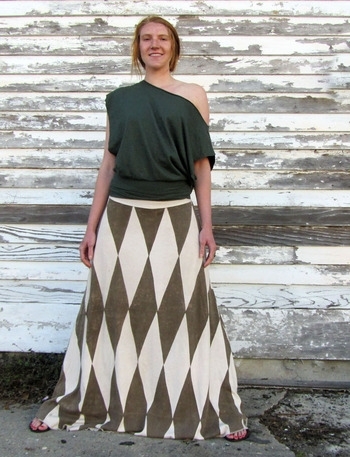 Here's what I wore: light hemp/organic cotton knit kaftan shirt in chocolate, medium stretch hemp tube top in terra-cotta, and organic cotton simplicity blockprint 4" shorts with the large, pomegranate blockprint. I topped the whole outfit off with one of our woven necklaces in indigo, made with some of our leftover fabric scraps. If you place an order with us online, these adorable necklaces/headbands are often included as a special free gift. I also tested out some natural deodorant that we made for a previous blog post (Nourish-Natural Deodorant, Wednesday, July 30th). It worked brilliantly, so be sure to check out the recipe in that post. 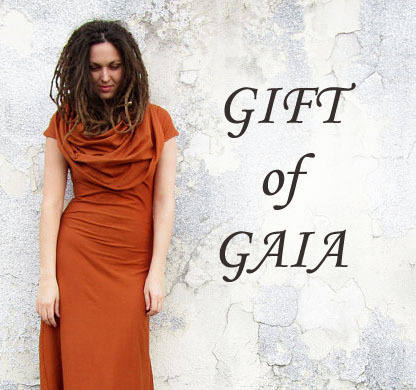 I began my trek outside of the Nomad Boutique where you can try on and purchase some Gaia Gear of your very own! Then I made my way to the Gaia Garden, which is just a few steps away from the store. When you come and visit, the garden is a must see. One of the plants that is used in our natural dyes here at Gaia Conceptions, indigo, can be found growing in the garden. While we do not have the space to grow the amount of indigo we would need to actually produce our own dyes, we are currently talking with local farmers who would be able to provide that service in the future. The garden is also just a peaceful, secluded place to relax, with whimsical lanterns hanging in native pokeweed, a plant with which the berries can also be used as a natural dye; and a babbling stream nearby bordering the train tracks that mark the site of the future Greenway connection. Just across the tracks you will see the Black Diamond Food Forest, another welcome addition to the Westerwood/Cedarwood neighborhoods where we are located. The Food Forest is currently under construction, but when completed it will provide an educational community space, promoting a unique spin on urban, sustainable agriculture. For more information and more great photos visit their website at http://www.blackdiamondfoodforest.com/. I made my way past the food forest and headed up Guilford Ave., took a left on Prescott St., and a right on Bellemeade St., making my way through the shaded streets of small, but well-loved homes. The surrounding neighborhood is an eclectic mix of cute cottages bordering the outskirts of Downtown Greensboro, opening up to a more commercial district with empty storefronts that are slowly transitioning to thriving businesses and new apartment complexes that have sprung up around those merchants. I took a left on N. Eugene St. and noted this transition from home life to work life, passing the baseball field on my left. NewBridge Bank Park where the Greensboro Grasshoppers play has been a draw for baseball fans since it opened in 2005. The buildings of downtown provide a subtle city backdrop in the distance. I stopped on the corner of N. Eugene and W. Smith to grab a much needed cold drink and a bite to eat for lunch at the Deep Roots Market. Another recent addition to the neighborhood, this cooperative grocery store and cafe offers a delightful selection of food from their hot salad bar. This is also a great place for the community, as they provide meeting space that is available to members to reserve and anyone can become a member to enjoy the benefits of the space and support fresh, local, organic food in Greensboro. They also have a helpful website with loads of information and photos: http://www.deeprootsmarket.coop/. After I finished lunch I headed West, back toward the studio by way of W. Smith St. I made a left onto Prescott St. at the completed cornerstone for the Greenway that will eventually be connected to the train tracks as I mentioned earlier. To the left I spied some graffiti on one of the older buildings that is located across the street from our studio. This area is set to be transformed into a multi-use complex in the future that will provide both housing and businesses in one place. I sort of like the look of the graffiti, but we are all excited here at the Gaia Studio and Nomad Boutique to watch our neighborhood grow and thrive in new and unique ways. I hope ya'll will take the chance to come and visit us here, and that you will get out of your car and take a walk around in your Gaia gear! Until next time...remember to listen to your inner nomad and explore the universe one step at a time.